When you first set eyes upon Kawasaki’s new middleweight contender you can’t help but be amazed by its quirky styling. A distinctive mushroom shaped headlight and side lights set-up, give the bike a unique front end appearance. The quirkiness is continued with petal disks and unusual swing arm styling, with a large exposed off-set monoshock; but the best feature is the stubby stylish bullet shape under engine exhaust. Further styling touches like the red on white background analogue rev counter, combined with a clear digital speedo and information readouts (including clock, digital fuel gauge and two trip meters) and the compact indicators and the LED taillight with clear lens, all contribute to produce a unique visual statement. 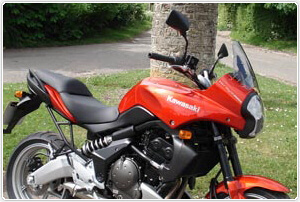 Our Versys was an eye catching deep candy burnt orange colour, which makes the bike stand out in a crowd even more. The whole quirky styling package just works and you find yourself liking the looks more and more, which are a strange cross between a sports bike and a trail bike. On paper, the Versys looks to have the credentials to satisfy many of these roles. 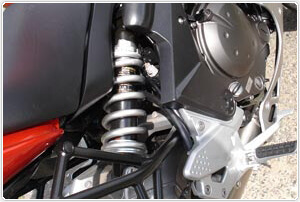 It has long travel suspension, a requirement of a trail bike; but combined with stiff spring settings for the sports bike rider. The bike can cope with the worst British roads can throw at it, from potholes, poor road surfaces, loose gravel etc., but does not end up feeling like a pogo stick The bike seems to ignore poor road surfaces enabling rapid progress to be safely made. It’s like having the sharp und unflustered suspension of a sports bike on a new tarmac road, but translated to producing the same effect on a rough country back road. The suspension is stylish, at the front; the bike sports upside down forks and the rear has an aluminium gull type swing arm linked to a large external visible Showa rear shock unit. Both have adjustable rebound damping and preload. The bike has 17″ alloy wheels which assist the bikes quick steering. They are shod with Dunlop SportMax road tyres, no trail tyres here. This is the one limitation; the bike is not designed to be taken off-road. It has off-road style suspension, but the bike is meant to be kept on the black stuff, or even the odd paved or cobbled street, but mud tracks are not its province. Shame really! This bike is supremely comfortable. It offers an upright riding position with wide handlebars that allow your body to adopt a very natural posture, without any of the arm neck and back strains that a dedicated sports riding position endures. The slim stock saddle is very supportive. 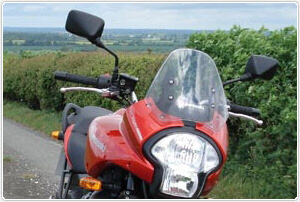 The seat has two levels; the pillion portion is set a little higher, which allows the rider to be cushioned at the back by the rise in the pillion seat. You sit down and into the bike, but also upright with a long leg stretch, with an 840mm seat height this bike is not for the vertically challenged. Such comfort characteristics enable the bike to meet another role, that of tourer. The bike can be ridden for long distances in relative comfort and not leave the rider a muscle crippled wreck. I spent several whole days on the Versys and just couldn’t fault its comfort. Normally I’d expect to have to invest in an upmarket tourer to achieve this. The touring role can be further extended by the fitment of an optional top case and Givi panniers, however under-seat storage is a limited to a U-lock or similar. Good mileage range is another essential tourer feature and I achieved an average 53 mpg from the 19 litre tank, giving an approximate range of some 220 miles between fill ups. Touring holidays are a real possibility on the Versys. However the bike is a naked model and offers no weather protection other than a short height adjustable screen. A taller screen as available as an accessory, which I’d definitely fit if the Versys was to be used regularly for touring. The Versys has a very slim profile which helps make the bike a very competent, commuter bike. 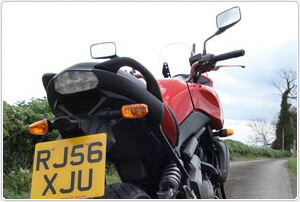 The quick steering and narrowness, aided by big clear mirrors, means riding in traffic is easy. Particularly when combined with the upright, tall riding position, you have an excellent view of the road and obstacles ahead. Is this multi purpose machine going to satisfy the sports bike rider? Well “yes”, the riding package is nothing short of amazing. It may be only a “650”, but nobody’s told the Versys that. It feels like it has the power delivery of a much larger capacity machine. From above 3,000 rpm the bike pulls strongly and will wind up to the red line in each gear, with a rapidity that will really surprise you. 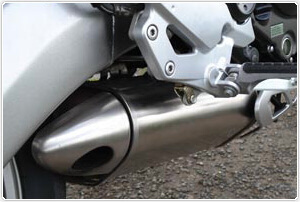 Combined with a muted howl from the beautiful under engine exhaust cone, you’re instantly in sport bike territory. The bike may only have 64 PS on tap at 8,000 rpm and 6.2 kg-m of torque at 6,800 rpm, but the power deliver definitely says less is more. The Kawasaki engineers say they have optimised the performance of the parallel twin engine for everyday riding in the 50-75 mph/ 3,000- 60000 rpm range, but also to give it a quick revving and powerful feel. I’d say this is exactly what they’ve done. The bike delivers a smooth, quick, powerful and a punchy ride from 3,000 rpm which continues to the redline and beyond; with no discernable power peaks or troughs. In the higher gears though the bike can become jerky below 3,000 rpm, so down changing is necessary at lower revs to keep the bike engine spinning sweetly. In many ways the power delivery is akin to a big single rather than a twin, with loads of torque, engine braking and instant throttle response being the major characteristics. The performance is delivered thorough a six speed gear box that is so smooth, that clutch-less gear changes were easily and often achieved. The only minor gripe is when selecting first gear from cold there is a bit of a clunk, but once the bike has warmed up this disappears. When you feel the need to use the clutch, its action is very light and smooth. No sports bike package is complete, without great handling. Here again the Versys delivers, this bike is just so flick-able. Hustling it around wet, crap strewn country back roads, the 181 kg of bike can change line with amazing agility and not get shaken off-line; backed by a confidence that it won’t let go on the worst of road surfaces. The Dunlop SportMax tyres felt like they were glued to the road, and the agility, combined with the gutsy engine make this bike a really “FUN” ride. However there is a small “fly in the ointment”, the brakes. On paper they should be good, triple petal discs, with dual piston callipers up front and a single calliper up rear, should give this bike real stopping power. They work well enough, but they exhibit a lack of feedback and firmness of action. However the powerful twin engine, produces so much useable engine braking, that I found myself rarely using the brakes. On test I deliberately hunted down twisty country backgrounds so I could revel in the bikes fantastic grip levels and sports bike handling. This bike will truly surprise many hardened sports bike riders with the ride it delivers and enable you to enjoy many roads that would be virtually un-rideable on a sports bike. However this bike is not just a back roads bike, with an estimated top speed of 120 mph, the bike can devour motorways, dual carriages ways and fast A-roads with equal skill. With a redline set at 10,500 RPM, cruising at motorway speeds is a relaxed 5,000 rpm in top gear. So many times when manufacturers set out to design a bike that is supposed to be an all rounder, it ends up being a big compromise. However Kawasaki has delivered; this bike truly is versatile and would seem to handle of each of its multi character roles with a surprising degree of accomplishment. Now I know it won’t go off-road, but how many of us really ever take our bikes off-road. But it will handle the poorest of road surfaces wet and dry, with truly sports bike inspiring handling and confidence, plus it will happily fulfil roles as a tourer and commuter bike as well. The Versys is also the mid range bike that thinks it’s a big bike and delivers as such. If there’s only room in your life for one bike, which almost does it all, the Versys may just have your name on it.